Butternut squash is a common sight in supermarkets nowadays and has enjoyed a phenomenal rise in popularity over the last few years. Available all year, it’s tasty, nutritious and incredibly versatile. It can be prepared, cooked and served in so many different ways and enjoys a deserved reputation as an excellent staple for anyone enjoying a low-calorie menu. The firm, yellow flesh of the squash becomes wonderfully sweet, creamy and nutty when cooked which means it is excellent when mashed. Start by roasting the squash. You can keep the vegetable whole or cut it into wedges, which helps to reduce the cooking time. Roast the squash using a fine mist of oil spray and season lightly with black pepper and a little salt to taste. Set the oven at 200ºC and bake the wedges on a baking sheet for about 50 minutes. If the wedges are browning too quickly, cover with foil to prevent burning. You don’t need to peel butternut squash, the skin is delicious when roasted and a low-calorie snack in its own right. When cooked, it’s really easy to scrape the flesh from the skin. Mash the squash with a generous dollop of low-fat cream cheese. If you adjust the consistency you can turn it into a sauce by adding some milk. The resulting sauce is exceptionally creamy and tastes anything but low-calorie. Alternatively, you cam mash the squash into a serving of mashed potatoes. The lower calorific value of the squash means you can use butternut squash to add flavour and bulk to simple mashed potatoes without adding any significant calories. Who would think there would be a low calorie answer to the potato chip? Butternut squash is a most acceptable substitute. It can even be cut into chip shapes and then sprayed with a light oil spray. Roast for around 25 minutes at 200ºC and you have a tray of delicious vegetable chips. Sprinkle with salt and vinegar in the same way as chips. They are particularly delicious if you don’t peel the squash, when the skins roasts it caramelises and adds an extra dimension to the finished dish. Prepare a simple rub for the squash by blending a tiny amount of olive oil with garlic, chilli and cumin before rubbing it into the skin of the squash and roasting in the same way as usual. 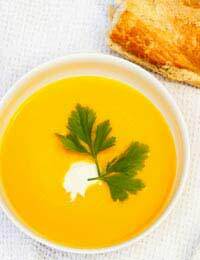 Butternut squash makes very tasty soup which is so rich it could be full of cream. It’s incredibly easy to make, packed with natural goodness and light on calories. Start by roasting the butternut squash with a mist of low-calorie cooking spray on 200ºC for about 25 minutes. When tender scoop the flesh from the skins and set aside. Lightly sauté the onions with a drizzle of good quality olive oil At this point you can add extra flavourings to the soup like chilli, cumin or curry paste. By cooking it in with the onions, the flavour develops and matures better. Before the onions start to colour, add the squash back into the pan and add enough vegetable or chicken stock to cover the squash, now simmer gently for 15-20 minutes. When the vergetable is tender, use a stick blender to create the consistency you desire. If you have made your soup spicy, finish with a swirl of low-fat yoghurt. Butternut squash is a real find for anyone looking to reduce their calories. In addition to these cooking methods, you can use it as an ingredient in recipes for pasta, risotto and chillies or curries. It’s not the prettiest vegetable in the world but it’s what’s inside that counts! Try butternut squash and your low-calorie menu will expand to include lots of exciting and tasty new dishes to sample.